Star Trek: Discovery has had more downs than ups, but a couple of standout moments did remind us of the Star Trek universe we know and love. The best (so far) has to be the seventh episode of the series, “Magic to Make the Sanest Man Go Mad.” Discovery’s foray into time loops wasn’t exactly heavy on plot, but it turned out to be a surprisingly heartfelt episode—one that only exists because the series was strapped for cash. Earlier this week, CBS held an Emmy “For Your Consideration” event centered around Star Trek: Discovery. 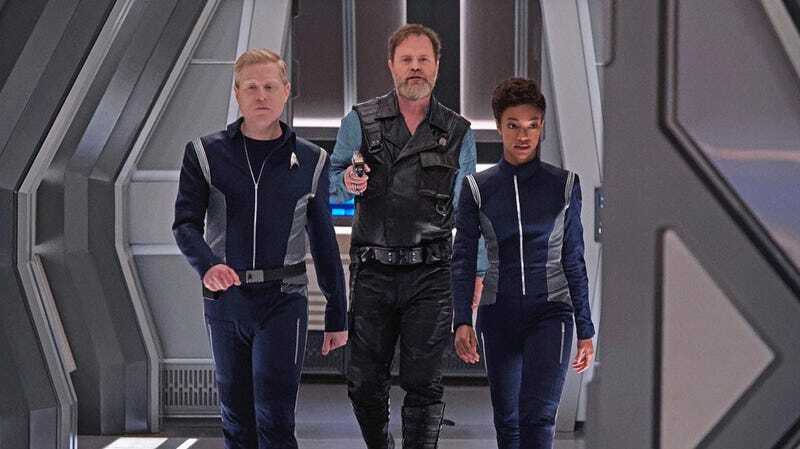 As reported by Trek Movie, during the discussion co-showrunner Aaron Harberts chatted about “Magic to Make the Sanest Man Go Mad,” a bottleneck episode where Harry Mudd (Rainn Wilson) causes a series of time loops on the Discovery, with science officer Paul Stamets the only other person on board who knows they’re happening. It’s widely regarded as one of the best episodes of the new series so far, a classic Star Trek-esque standalone. It’s only made more classic once you realize the reason they did it. “In terms of the time loop, we were desperate to save money, I am not going to lie,” Harberts said. Honestly, that kind of sums up Star Trek’s greatness in a nutshell. Whether it’s budgetary issues, syndication demands, or simply the desire to say something different, Star Trek’s departures from its series norms have tended to result in some of the franchise’s best works. Like Star Trek: The Next Generation’s iconic “The Inner Light,” which many thought was going to be just another one-off filler episode but resulted in an iconic and complex character journey. Or Star Trek: Deep Space Nine’s “Far Beyond the Stars,” which let the series step outside of itself to comment on racism and bigotry in the realm of science fiction. But, when [co-showrunner Gretchen J. Berg] and I sit down and decide to do a time loop episode, we ask what do we get out of it and what are the bigger pieces that are going to contribute to this giant tapestry that Gretchen and I feel very responsible for weaving a universe. For Hugh and Stamets, that is learning more about their relationship, like the Kasseellian opera, which is something that starts there and gets threaded through all the way through season two. Little tiny things that make our characters feel alive, that continue to build on who they are and who they will become. Given what happened to Culber later, that’s not very comforting, guys. Ugh, now I’m sad. At least Harry Mudd was fun, right? Star Trek Discovery returns with season two on CBS All Access sometime in 2019.